In 1990, Pradeep Man Sakya was struggling his hands to shape us his career. Garment and textile business was a top trending business those days. Maybe, we can visualize them to IT and investment market of today. Pradeep with his one good friend, determined to get their hands dirty in the flourishing garment Industry. The team of two bought fifty garment weaving machines in second hand. It costs them 4.5 lacs initially, giving birth to their journey of Entrepreneurship. The business went so-so. Even, after five years of operations, the garment factory would not become a sustainable one. Pradeep’s friend quit and took off his shares off the business. Pradeep was then alone, struggling and surviving through his hard days alone. On a casual day, Pradeep was on a random day out to Bhaktapur. He saw locals of Bhaktapur weaving Nepali cloth on this casual roaming day out. He wondered, if this could be a turning point in his business too. If only a final touch up (fine tuning) of these clothes could make better business. Pradeep decided to give it a try. And, indeed this turned out to become a big move in his career. He decided to visit Japan, in search of potential market for Nepali clothes. He risked going to Japan on the cost of his idea. And, this worked out. Japanese loved the composition of Nepali clothes. Pradeep returned with a huge bulky contract and eight thousand US dollars. In a slow and steady manner, his business started growing back again. The Nepali garments he produced were equally sold in France and Germany. Pradeep has to employee four hundreds employee to work with him to meet the demand of National and International Market. At that point of time, the garments were identified with its brand title “Karuna”. Even after you see your idea grow, the is no ultimate absolute title you can hold in business. With growing political instability in Nepal, in 2008, Pradeep again got into a dilemma. The political instability constantly affected the garment industry, its operations and workers quitting their jobs to settle abroad were inescapable challenges Pradeep too had to face. It seems running a business, is only about increasing operations costs. There was no charm left in production, demand, sales and revenue. Pradeep spend next two years in transition. Get up every morning, go to the workplace. Keep the place, the old machinery clean, just hang around but with a quiet determination inside. “The context, market and economic trends of Nepal shall definitely take another big turn some day soon.” Pradeep has learnt determination, persistence and resilience being a Nepali Entrepreneur. There were definitely slight changes in market after two years. Pradeep again resumed receiving orders, the business showed good signs. The next concern, Pradeep paid attention was on if his garments could be affordable by a greater market of working class Nepali people. “Being a Nepali, producing original Nepali clothes, the wears were not affordable to a average Nepali.” This questioned Pradeep’s identity and existence in the Entrepreneurial ecosystem itself. He had to seek an alternative to address this issue. This gave birth to the rise to “Jo:Jo Wears”; to the rise if the King’s wears. Jo:Jo comes with the design of our valued ancestors, Kings, Gods and goddesses, culture and civilization, art and tradition. Jo:Jo wears is a replica of our civilization. Our identity, origin and belongingness. It portrays our culture in form of wear. That too, not a difficult attire to carry in this busy urban life. Its modern, cultural and symbolic at the same time. “JuJu Wears” has a positive effect on many other industries and professional groups of artists, tourists, celebrities. You can preserve anything this is becoming rare in modern days. You can amplify anything that is on the trending charts. Readers, there is always something to take over from every story. 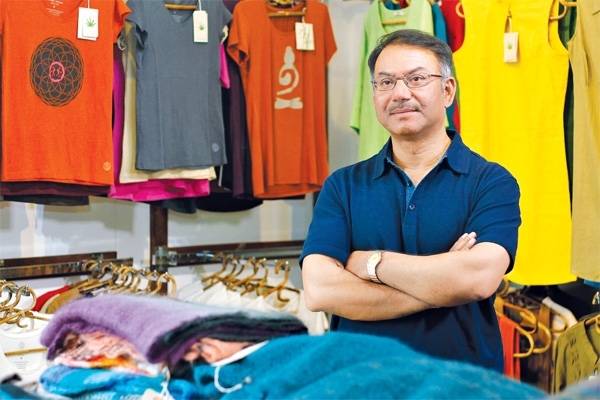 What sort of Entrepreneurial spirit did Pradeep Man Sakya carry? Express your views, in the comments below.